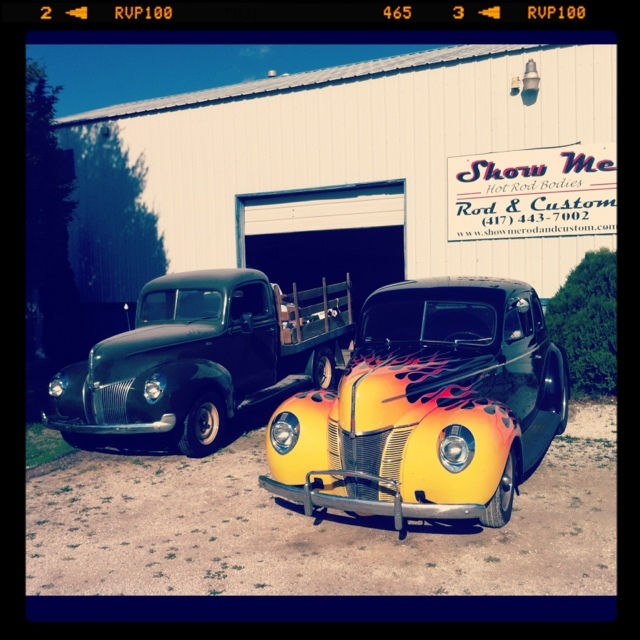 Got down to Show-Me Rod & Custom around 11am, to finish up my last few wiring tasks. Didn’t get a single one done! Started by working on the rear passenger side brake. Took it apart and fixed the bent shoe, relined both shoes, worked on the lip of the drum that was causing it to bind on the shoes and put it all back together. Then…I got to looking at the back end and decided to swap go ahead and swap the rear spring. The swap dropped the back down so there is about an inch between the top of the tire and the lower lip of the bed side. Fits GOOD! After getting the spring swapped, I decided to start the truck and pull it outside the building for a few pictures, only to have my starter quit working. Decided not to mess with that, but go ahead and put the reversed eye spring that I have in the front of the truck. After messing with getting the old shackle bushings out of the wishbones, I started to install the spring. What I had forgotten is that it is for SPLIT ’40 wishbones, so it’s about 4 inches too short! I had intended to put it in my coupe, but didn’t even consider the width difference in the ‘bones between stock and split! So…looks like I will be calling Speedway tomorrow, and should have a new Posies spring by Tuesday. Good thing I am not paying myself by the hour, as I never stopped for lunch and dinner and didn’t get home until around 9:15pm! Tuesday, I plan on putting a spring back in the front, pulling the starter out to figure out why it quit working, and finish wiring up the gauges and sending units and the front turn signal/parking lights.